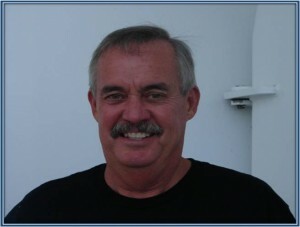 John is the 2nd Mate aboard the R/V Endeavor. He is not a long-term part of the crew, but instead is a contracted officer. His experience and expertise with charts and navigation are a perfect fit for this cruise, as that is one of the main roles of the 2nd Mate. As a child born in North Carolina, and growing up on the South Carolina beaches, John spent every chance he could on the water. Getting into jobs like lifeguarding and working with boats at a young age it was no surprise his life-long career was ocean-orientated. He even spent time as a teenager working on the Yankee Clipper with the Windjammer Cruises, before coming back to the states to finish his college. John began his official career on the sea upon graduating from the University of South Carolina with a B.S. in Marine Science. Nearing his commencement, he had the opportunity to interview with both Shell Oil and NOAA; ultimately he chose to go with NOAA and started out as an ensign in the NOAA Corps. Over the years his training and work brought him from South Carolina to New York, Norfolk, Miami, and even California. As time passed he worked his way up on 5 different ships, two of which he was Captain over. John’s main focus has been in nautical charting. He has worked to build charts, been a part of conducting and collecting survey data, and eventually even compiling that data. When his time with NOAA came to a close, John turned to work with Duke University as their Marine Superintendent for the Cape Hatteras. That job had him over all of the logistics for each cruise: from food to fuel, he was making it happen for each of that vessel’s cruises. John also earned his Masters in Hydrographic Science, which is tailored to nautical charting. He truly enjoyed working on this degree, as it allowed him to fine tune and broaden this skills he had been using for years with NOAA. Though John’s career took him away from his hometown of Myrtle Beach, SC it eventually brought him and his family back to Charleston, SC where they are living today. He is a proud father of two sons, one a graduate from UC Davis with an M.S. in Biophysics and the other an Actuary with an Insurance Firm. He does say the time away from his family was very tough, but is content with how things have worked out. He has loved travelling with his jobs, especially during his time aboard the Ron Brown; during that expedition he visited Iceland, Madeira, and Brazil.